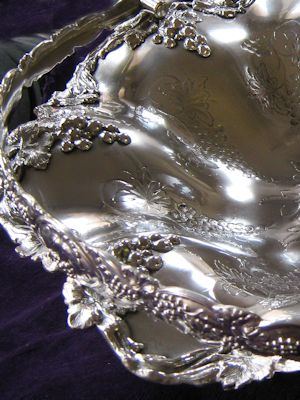 We offer a traditional silver plating service in Glasgow for the restoration of a wide range of antique silverware including trophies, trays and holloware (to name a few). Electro silver plating can also be applied to a range of other metals including copper, nickel and brass. The Process of electro silver plating involves depositing a thin covering of silver onto a conductive surface – this is achieved through passing a current through each item in an electrolyte solution. After a final buff and a polish each item is restored to its former glory. If you are interested in finding out more about our silver plating service just email a picture of your item to info@visionsinsilver.co.uk and we will be in touch soon.